I’ve always enjoyed The New York Times’ “36 hours” travel series — even if it hasn’t always been entirely original. I’ve referred to it as a guide for planning weekend itineraries both very close to home and very far away. It’s not that I believe that 36 hours is sufficient to explore most places — I expect I’ll still be discovering things about New York after 36 years — but I appreciate how the day-and-a-half constraint compels prioritizing and efficient use of time. For my visit to Seattle, though, the difficulty of that challenge was increased sixfold. We rolled into downtown, past the Rem Koolhaas-designed central branch of the Seattle Public Library — next time, I’ll take a tour — to CF and MT’s swanky hotel. 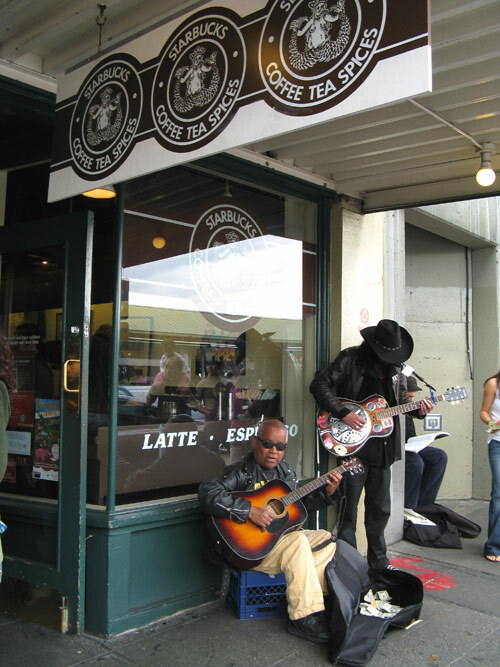 I hung back in the lobby as they checked in, sipping the hotel’s lovely lavender lemonade, and put the question to the friendly desk clerk: six hours in Seattle — how should I spend it? Out came the handy tourist map: it turns out that many of the city’s major sights are within walking distance of downtown, which gave me just enough time to take a brief tour before heading to the airport. 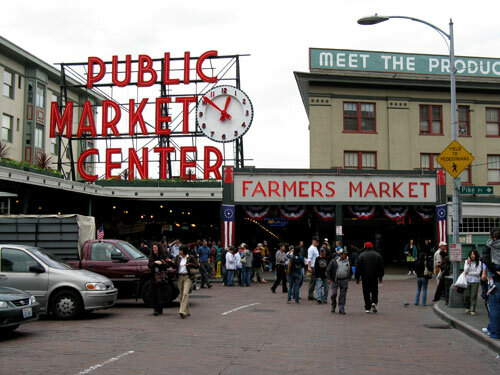 Our first stop: Seattle’s famed Pike Place Market, which claims to be the nation’s oldest continuously operating farmers market, having celebrated its centennial in August 2007. I’m skeptical, by the way, that the oldest market in America would be located in northwest Washington State; Reading Terminal Market in downtown Philadelphia claims the same distinction, and more believably. 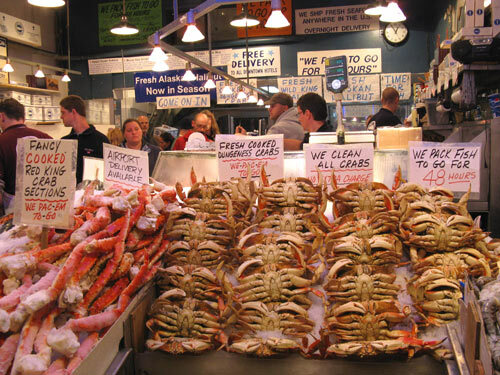 We did a quick walk-through of the seafood stands where feisty fishmongers tossed and waved their wares before crowds of gawping tourists and locals. I was just as impressed with the flower stands with their kaleidoscopic array of fresh-cut blooms… and at prices far lower that any I’d ever encountered in New York. Local and exotic produce stands, pasta makers, specialty food purveyors with a few craft vendors rounded out the rest of the stalls. Lunch was a quick and serendipitous stop at The Market Grill — an unassuming U-shaped lunch counter inside the market where I had one of my best fish sandwiches in recent memory. Nothing fancy: just impeccably seasoned and grilled halibut on a baguette, with grilled onions and homemade tartar sauce, served with a side of homemade slaw. At $12, the sandwich had seemed pricy initially — this coming from one accustomed to pricy sandwiches — but after that first bite, I felt it was worth every penny. Good find! 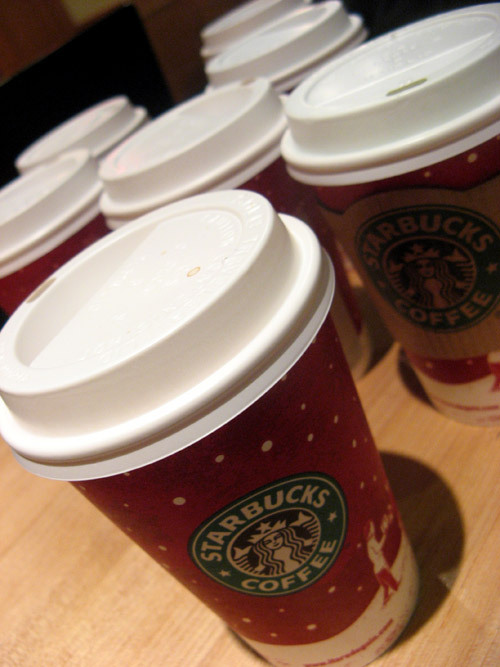 The line of caffeine addicts stretched down the block to enter this Starbucks, despite the fact that there was no shortage of places to grab the same cup of coffee elsewhere. Is this a sculpture of a badminton birdie? Upon closer examination, we recognized the inverted umbrella, no doubt a whimsical reference to Seattle’s reputation for rainfall. (Despite the near-constant cover of clouds, we lucked out, weatherwise, this afternoon.) 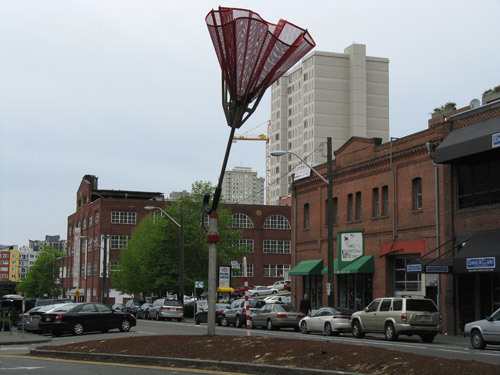 “Angie’s Umbrella” (Jim Pridgeon and Benson Shaw) is located on a corner in Belltown, an artificially flattened 63-square-block neighborhood, dubbed “Seattle’s Soho” for its bohemian feel and newly trendy shops and restaurants. 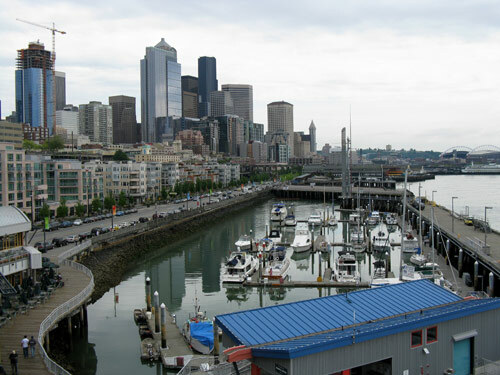 At the Bell Street Pier Cruise Terminal at Pier 66, also the site of the Odyssey Maritime Discovery Center, dedicated to the history of shipping and fishing in Puget Sound. 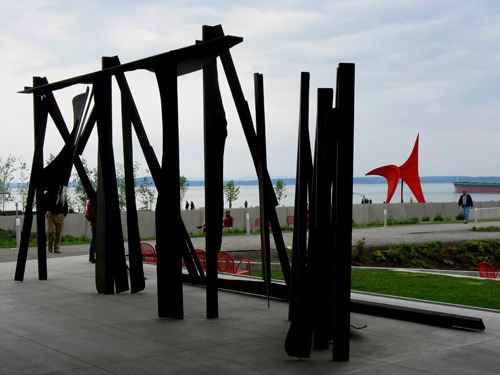 One of our favorite sights was the Olympic Sculpture Park, a 9-acre waterfront, former industrial site that was converted into a green space for art by the Seattle Art Museum. (I do so appreciate this movement of transforming urban waterfronts into public spaces.) The $85 million park opened with a two-day celebration back in February. From the quirkily leaning “Typewriter Eraser, Scale X” (Claes Oldenburg and Coosje van Bruggen) to the monumental sculptures by artists such as Alexander Calder (whose orange “Eagle” is the centerpiece), the park offers stunning views of art and nature. 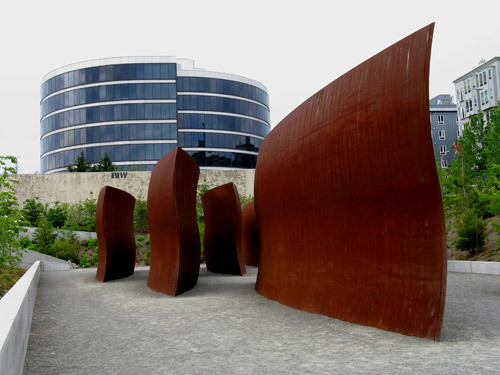 Here, on the lower level, are the five swooping, asymmetrical COR-TEN monoliths that comprise “Wake” by Richard Serra, whose work we recognized from the MoMA exhibition last summer. Elsewhere, the 6’ by 19’ fan-shaped steel cut-out of New Yorker Ellsworth Kelly’s “Curve XXIV” looked like it could have been fashioned from Serra’s studio surplus. Check out the full Seattle photo set — all six hours worth — on flickr. We stopped in at the 24-hour Starbucks in my neighborhood to post-mortem the evening among the other night owls, and stumbled onto a new employee training session in progress. Baristas Dan and Exodus plied us with their practice creations and before you knew it, we were the very buzzed recipients of seven tall drinks: a no-whip peppermint mocha, a cappuccino, a non-fat latte, a soy green tea latte, a double espresso macchiato, a soy chai latte and an Americano. I guess I wasn’t planning to sleep tonight anyway.